This is an interesting study that BBC commissioned from a couple of market research companies (something that you should take into account while looking at its focus and approach), and is packed with interesting glimpses into the role of games in different people’s lives. If only someone would fund academic games research with similar scope! 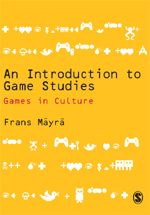 This is a companion website for An Introduction to Game Studies: Games in Culture, a textbook by Frans Mäyrä, published by SAGE Publications, Ltd. This site is maintained by the author in blog format and it provides further resources to the teachers and students using the book.